First off, I have to say that this is not my usual read. While I love YA and fantasy, this definitely falls more into the horror genre. I was expecting a ghost story, to be sure, but this was a bit more. And I have to say, it’s what made me really like it. The story is about Cas Lowood, a young man who is following in his father’s footsteps as a ghost hunter. 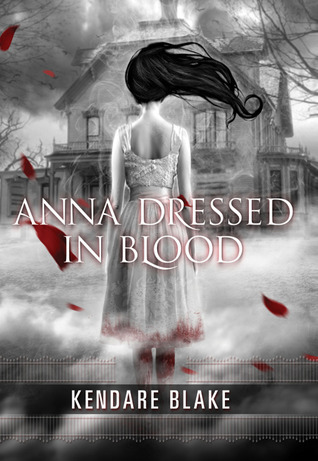 Armed with the athame that has been passed down in his family for generations, Cas heads to fight a legendary ghost – Anna Korlov, also known as “Anna Dressed in Blood” due to the large slash across her throat which stained her white dress blood read. As Cas keeps going to Anna’s house, he soon realizes that she is different from the other ghosts that he has dealt with, much stronger and vicious. She also doesn’t seem to want to attack him for some reason. This was a very interesting story. I really enjoyed the characters and the ghost mythology. While some of the scenes were gruesome, it added to the creepy atmosphere and lent itself to the story. Cas has to solve the mystery of Anna, but also figure out how his father died and what killed him. It’s a strong mystery, with an ending that I did not see coming. I am definitely going to read the second book as soon as I have a chance.